Just from looking at our extensive portfolio of agricultural exhibits and displays over the years, its easy to see some trends. One of the most obvious trends has to do with the topics we’ve touched on in each of the displays. We dream up displays for a huge variety of agricultural groups that each have distinct missions. Sometimes these distinct missions come with customized messaging. But, more often than not, the messages of these groups echo one another. All of them are connected by common issues, and they frequently end up teaching a lot of the same stuff. As a result, it’s common for us to see the messaging of our displays overlap with one another. And one topic in particular that has shown a lot of overlap is the topic of nutrient deficiencies. Over the years, we’ve had three primary displays that touch on this crucial topic, although others have dealt with it as well on a smaller scale. The cool thing about the main three, though, is that they each deal with the issue in a slightly different way. These nuanced methods of teaching the topic give varied perspectives that appeal to different kinds of learners and reveal different elements of the issue. Let’s give each of them a look. The displays that probably deal with nutrient deficiency in the most straightforward and obvious manner are the nutrient deficient plant models. These are realistic representations of actual plants. They’re made to look like they’re suffering from nutrient deficiencies. Hand-painted coloring as well as hand-sculpting of the leaves replicates a plant in the specific condition. For both the consumer and the grower, it’s valuable to see these deficiencies first-hand. Regarding the consumer, just about any visual reminder of the intricacies of farming is helpful for building their connection with food. It doesn’t matter if it’s as simple as a picture of a banana plant: that makes a big difference. After all, it shows them something about what their food is like before it hits the grocery store. And that’s not a perspective they get very often. 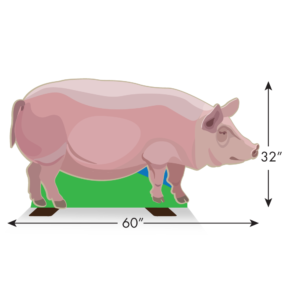 So, if a simple picture is so helpful, how much more of a difference will an actual 3-dimensional model make? Much less a model that shows what an unhealthy plant looks like? Obviously, the effect will be huge. When it comes to the grower, though, these models have even more value. The reality is that nutrient deficiencies cause real issues for farmers. But they can’t treat the issues unless they know what’s causing the problem. That’s why growers need thorough training in identifying nutrient deficiencies. Pictures can only be helpful to a limited extent. 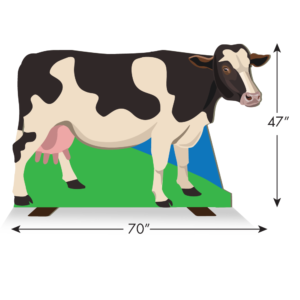 Ideally, farmers should be able to see real-life examples of the deficiency. That way, they can see not only the coloring of the deficient plant but also the texture and the size. And that’s precisely where our plant models come in handy—especially for folks learning during the winter months, when actual plants aren’t growing. 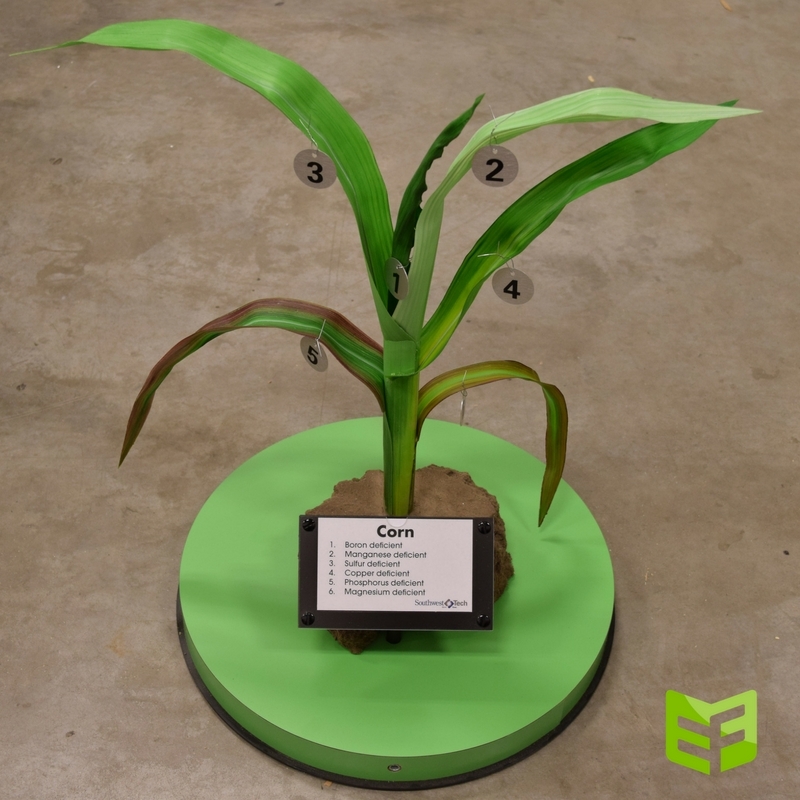 In the past, our plant models have gone to ag schools, where professors will use them for educational purposes. Commodity promotion groups, like state soybean checkoffs, have also ordered them for use at both grower and consumer events. Regardless of their precise uses, these artificial plants are effective tools for building a better understanding of plant nutrition. The second of these nutrient deficiency displays in our portfolio takes a completely different approach to the topic. 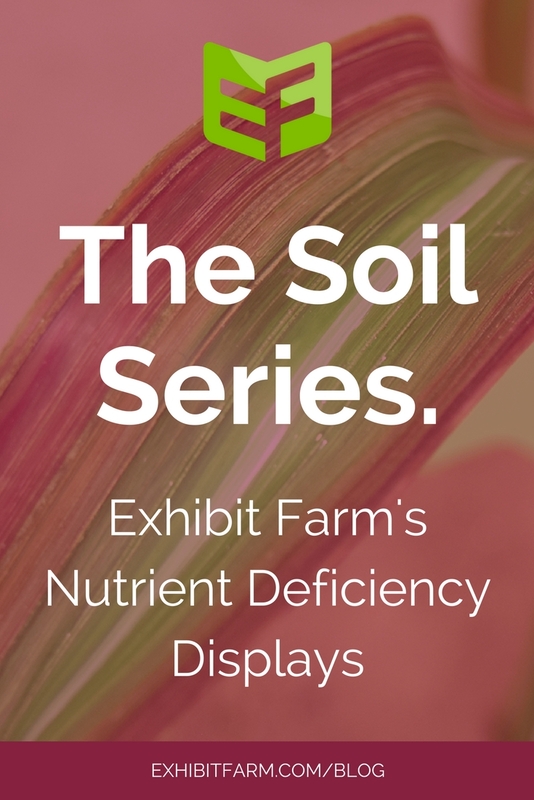 Rather than realistically depicting the effects of various deficiencies, this display offers an illustration of how nutrient deficiencies affect a plant. 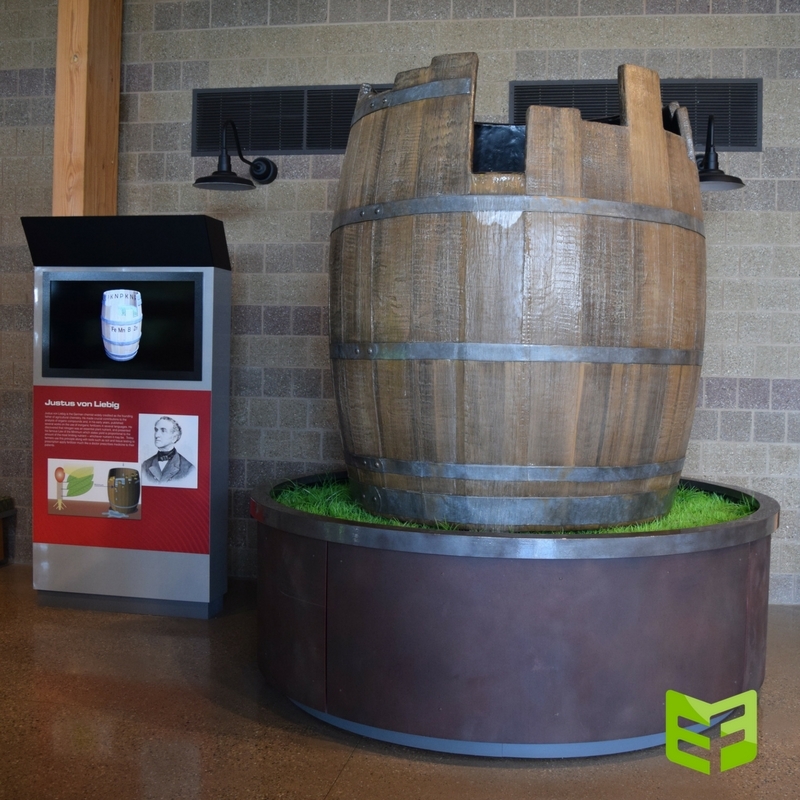 It illustrates the concept using a big barrel and some water. Inspired by Justus Von Liebig’s Law of the Minimum, we made one stave of the fiberglass barrel shorter than the rest. As water pumps up into the barrel, the barrel fills only until the water reaches the lowest stave. From there, it flows over the edge and back into the base of the display. The main idea here is that the barrel is only as good as its lowest point. Regardless of how big the rest of the barrel is, it will be unable to hold water above that low stave. As a slightly more abstract representation of plant nutrition, this image of the barrel gives a new perspective on the issue of deficiencies. Without over-simplifying, it breaks down the concept into one simple, visual element that’s easy to understand and easy to remember. The last nutrient deficiency display in our portfolio takes a third approach to teaching plant health. While the plant models give a realistic and tactile representation of the effects of deficiencies, the barrel display is a helpful mental illustration. 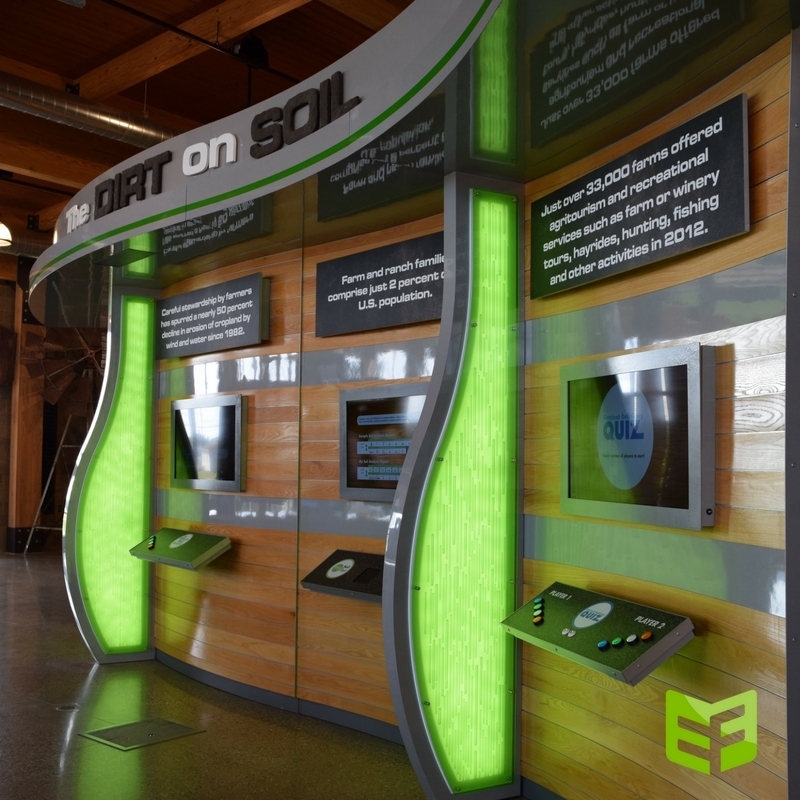 Meanwhile, the Dirt on Soil display we made for the AgroLiquid IQhub employs an interactive element to engage learners with the facts of plant nutrition. Through one-on-one trivia competitions and other interactive activities available on the monitors, visitors can engage with the facts. The games force them to think through the correlation between what they see above the soil and what goes on beneath it. Meanwhile, the activities and trivia also present visitors with intricate charts and advanced concepts that show the science behind it all. The activities test their skills of analysis. The trivia tests their knowledge. Both encourage them to dig even deeper. And both present them with information straight from the fields. Again, whether the visitor is a grower or a consumer, this display is valuable. For growers, it reinforces some of the most important concepts that they live by. For consumers, it gives them a glimpse of another world. This glimpse reminds them that the all-important task of farming is not as simple or as easy as they may have thought. Interested in learning more about these displays? Check out the following blog posts straight from our blog archive.